4th Street Boutique Designer Sale Starts September 26! 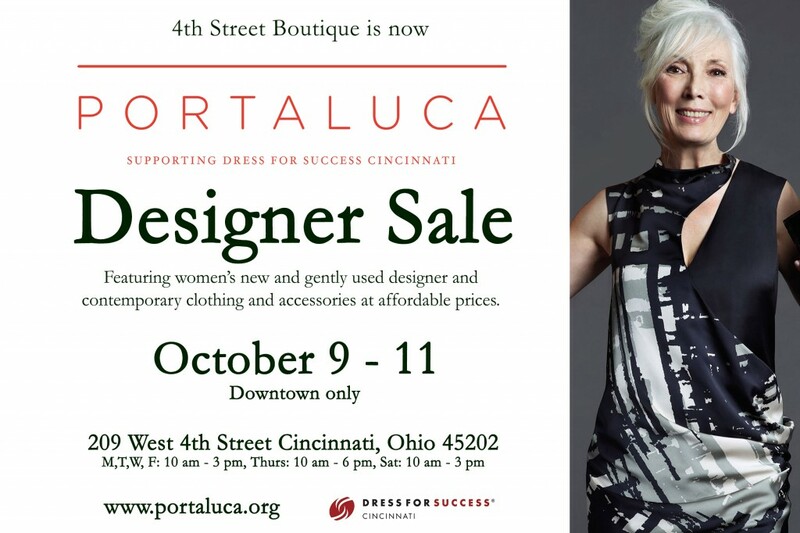 The 4th Street Boutique will be hosting its annual designer sale September 26-28 at their new downtown location to support Dress for Success Cincinnati! The store carries designers such as Etro, Calvin Klein and Armani. At the sale you’ll be able to browse and purchase women’s new and gently used fall and winter clothing to give your closet a little makeover in preparation for the next several months! 4th Street Boutique is located at 209 West 4th Street in Cincinnati. This sounds like a great deal supporting a great cause and I can’t wait to check it out! 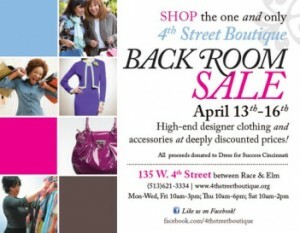 4th Street Boutique Designer Backroom Sale! 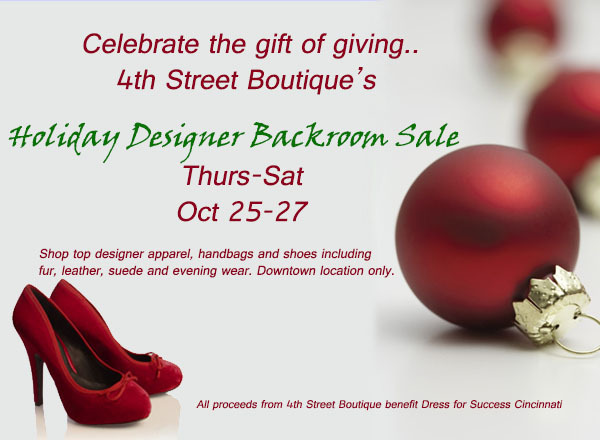 From now until October 27, 4th Street Boutique will be having a Holiday Backroom Designer Sale! The sale will feature designer brand apparel and accessories including furs, leathers, suede and evening wear. Some of the brands on sale include St. John, Armani, Etro, Akris and more! 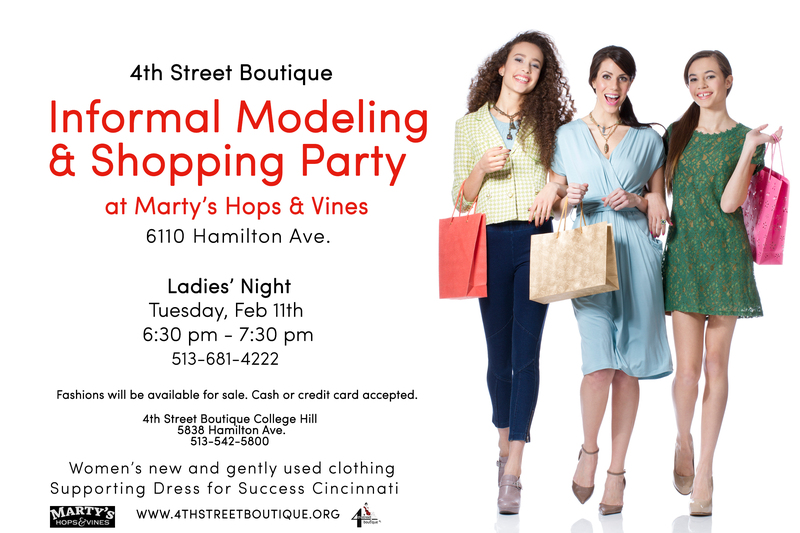 The proceeds from the sale will go to Dress for Success Cincinnati, which 4th Street Boutique supports. Prices throughout the store will be 25% off the ticketed price and items from the pervious sale will be 50% off the ticketed price. Make sure to mark your calendars and stop by for great fashions and to support a great cause! You’ll now be able to enjoy 4th St. 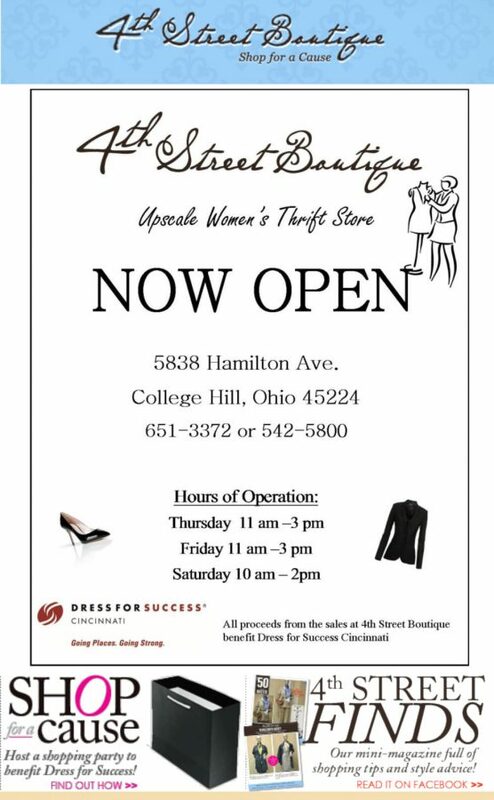 Boutique, an upscale women’s thrift store that supports Dress for Success, in a location other than 4th St. downtown. They recently opened the doors to a new store on 5838 Hamilton Ave. in College Hill. Hopefully, this new location will help gain exposure for the boutique and its cause. It’ll reach out into a new area, and also attract people who wouldn’t want to drive downtown and/or pay for parking. I love downtown though and it just got new credit card meters, so I’ll probably still do my shopping at the original 4th St. location still. There’s something nostalgic and metropolitan about shopping downtown! Happy shopping (for a cause! ), ladies!